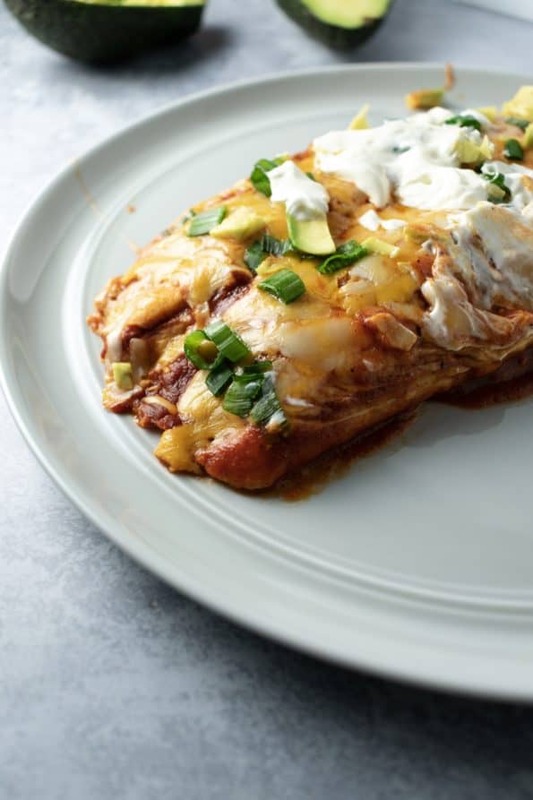 Skinny Beef Enchiladas taste indulgent, comforting, and delicious, but are a healthy, approachable, weeknight dinner that is sure to leave you wanting them again! Okay guys, I’m on a mission to increase the amount of easy and healthy dinners on this website for you all so that you have a dependable list of go-to dinners you’ll want to make again and again. Week day dinners in my book have to be: easy, under 30 minutes (unless its inactive time), healthy, and above all else – be delicious enough that the people eating it give rave reviews so that we’ll want to make it over and over. This is a fast way for a recipe to become a staple in our house that we like to fall back on in a pinch. Like I’ve said many times, I meal plan all my dinners the week before, but to do that I have a few that usually remain my go to’s for a long time! It can be really difficult and overwhelming to be making new recipes every time you cook during the week, so I usually only try 1-2 new recipes per week. This one ended up being too easy to fathom and…I made it three weeks in a row! The plus side is that its super filling (even for my husband), so we had leftovers each time. If you just started a diet for the new year, don’t fear! 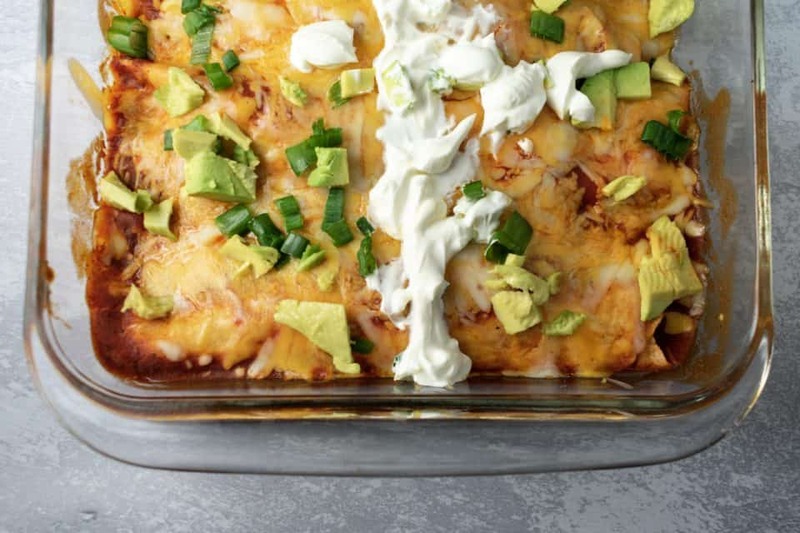 I know enchiladas SOUND like a heavy, carb loaded, comforting meal, but with some tweaks, one enchilada is just 223 calories! (ps. 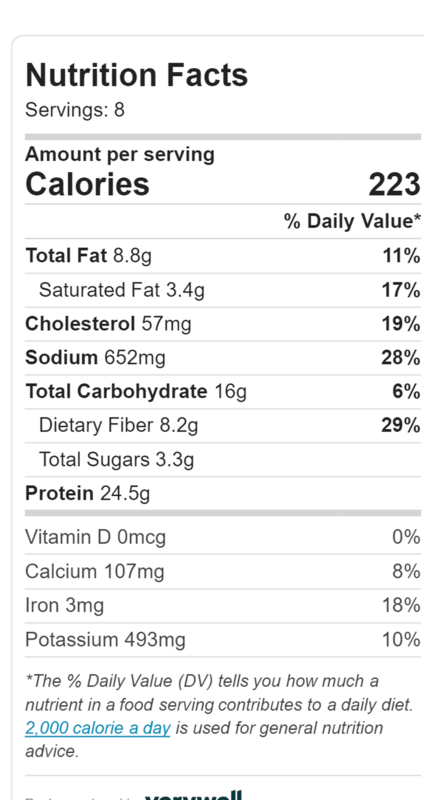 All 223 calories are entirely comforting). Whenever we go out to a Mexican restaurant I almost always get the enchiladas, mostly because I could never make them the same at home. I just love how they’re stuffed like a taco with meat, but then baked with melty cheese all over the top, enchilada sauce all around, and then topped off with fresh ingredients like avocado and sour cream. I think it’s the best of both worlds! I’ve tried so many recipes for enchiladas before and they either end up being dry, too complicated, too unhealthy, or just overwhelming. The start of this recipe came from the Skinny Taste blog, which if you’re not familiar with, Gina has the same approach to food as I do: comfort food done with a make-over. 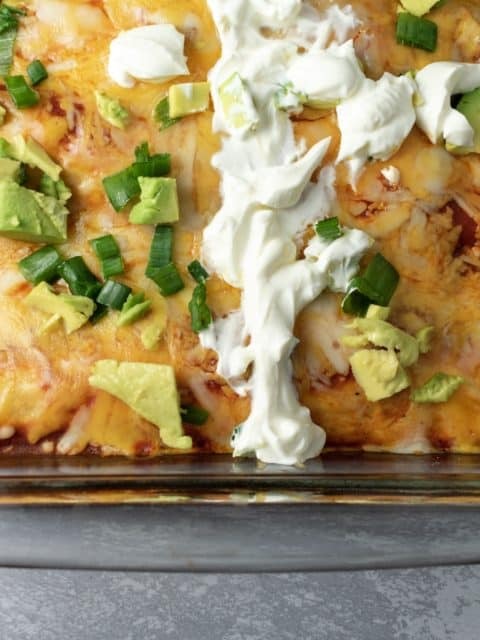 I found her recipe for Skinny Enchiladas which uses shredded chicken. Instead, I replaced the chicken with lean ground beef. I also made one tweak to the enchilada sauce which calls for adobo, but many that I have found contain MSG and I couldn’t take the chance as MSG is a significant migraine trigger for me. Instead, I substituted extra chili powder into the tomato based sauce. Heat a large skillet over medium heat. Add in ground beef, oil, onions and garlic. Break apart beef and combine all together. Let the meat brown for a few minutes. While meat is browning, heat a medium saucepan and add drizzle of oil and garlic. Let saute until garlic is fragrant, about one minute. Add in the tomato sauce, chili powder, cumin, chicken broth, and salt & pepper, stir together. Bring to a boil and then reduce to a simmer for 5 minutes. To the beef skillet, add in cilantro, cumin, oregano, chili powder, chicken broth, and tomato sauce. Stir together well and let the mixture come to a boil. Season with salt and pepper. Let simmer down for another 5 minutes. Take off the heat. 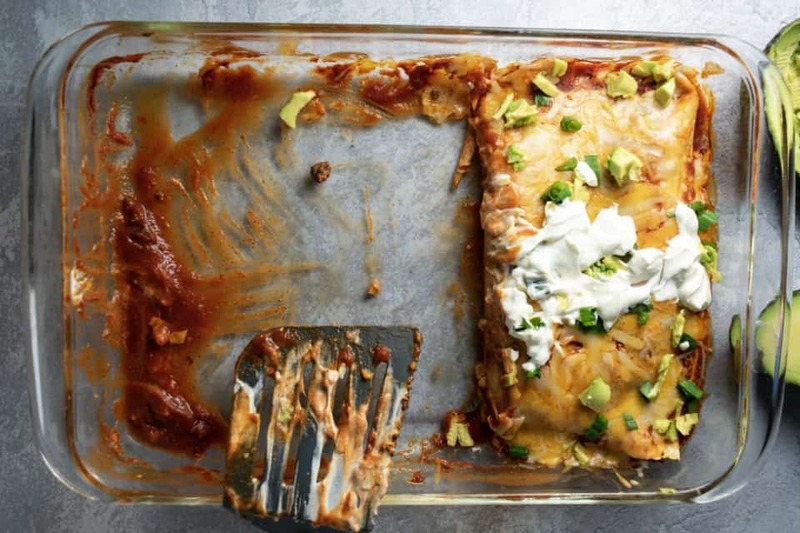 To make the enchiladas, take one tortilla and add in about 1/3 cup of the beef, roll it and place it seam side down in a 13 by 9 inch baking dish. Repeat to the other 7 tortillas, using all of the beef mixture. 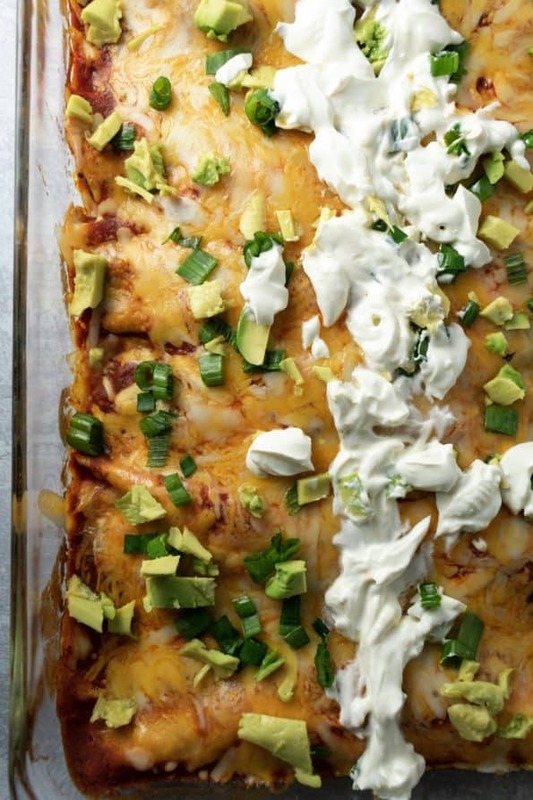 Top enchiladas with sauce, covering entirely. Top with cheese. Cover baking dish with aluminum foil and bake in the oven for 20 minutes.